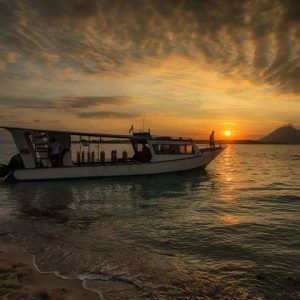 This premier dive adventure combines everything you hope for in one of the greatest dive destinations in the world! Palau offers world-class diving, with something for divers and snorkelers at all levels. With over 1,500 species of fish and 700 species of coral, the biodiversity here is enormous, and it’s all carefully protected by the Koror State Rangers. Welcome to the Fish ‘n Fins website, home to Palau’s leading dive and tour center. Established in 1972, we are the true pioneer dive operation in Palau. Fish ‘n Fins Dive center along with the Ocean Hunter fleet of liveaboards is owned and run by Navot & Tova Bornovski. We have created our website so it can guide and answer many of your questions about diving and visiting Palau with Fish ‘n Fins. There is more to Palau than just diving! If you’ve got a day to fill before flying home, or just fancy a day out of the water, we can offer guided kayak excursions through the stunning Rock Islands, land tours to the sights and history of the ‘Big Island’, Babeldaob, or fishing trips to catch the denizens of the deep. Let us lead you on a personalized land tour. In one of our comfortable mini-buses, we can take you up the rocky dirt roads of Babeldaob Island (the Big Island) to see the sprawling, panoramic view on top of Palau’s highest peak. Hike across the freshwater river, stopping to bathe in the mini-waterfalls and mountain pools along the stream, until you reach the big 80-foot drop waterfalls, and rejoice in that clear water. Head to the stone monoliths of Palau’s old civilisations. You can visit WWII tanks, relics and monuments, and even include stops around town at museums and the storyboard shops. The price includes lunch and cold drinks of water and tea. Enrich yourself in luxurious nature by the sea. 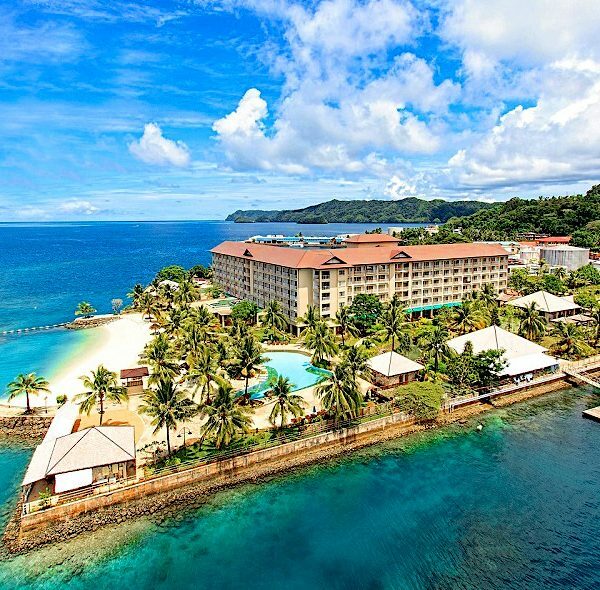 Stay in the luxurious Palau Royal Resort! 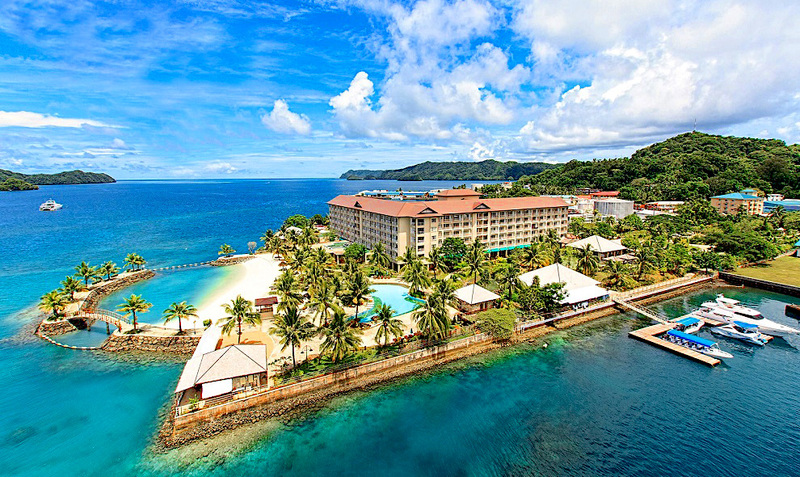 Take your life away from the hustle-bustle of the city and lie down, stretch your body beneath the deep blue sunny skies of Palau’s rock island beauties. Surround yourself among the cool blue waters around the hotel and enrich yourself with bright smiles of the local island people. 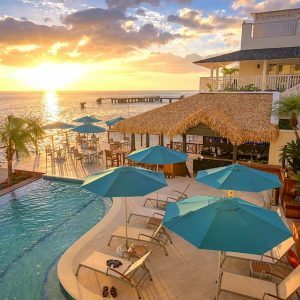 Enjoy clean spacious guest rooms with a gorgeous view of the peaceful ocean or a relaxing harbor scene overlooking from the balcony of each rooms. Be ecstatic on the offers of Waves Restaurant and the Breeze Bar bar surrounded by a green garden with the freshly grown flower beds, captivating beauty of the azure sea and a private beach that will ensure your journey to be an unforgettable one. Palau Royal Resort is the perfect place to meet your vacation standards, assisting to create moments with your family, friends or even with your loved ones. Passport requirement – must have 6 months remaining until expiration date upon return to USA. 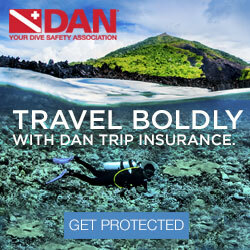 For all dive trips, consider purchasing travel insurance, and dive accident insurance. Both are highly recommended, and are made available to purchase! 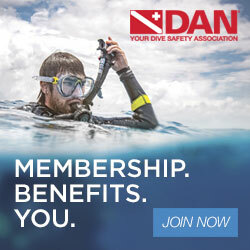 To purchase DAN dive accident insurance, please scroll to the bottom of this page, and click on the DAN banner link, Join DAN Today!, then follow the prompts on DAN’s website. 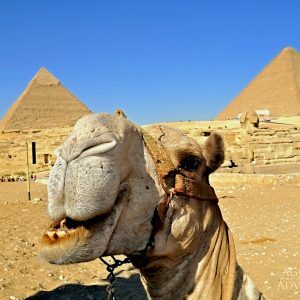 To consider travel insurance, please scroll to the bottom of this page, and click on the DAN banner link, Purchase Travel Insurance?, then follow the prompts on DAN’s website. Some sunscreen ingredients are not safe for corals; these include oxybenzone. Research indicates that these chemicals can cause DNA damage to corals, promote viruses in corals, and contribute to the bleaching of corals. Only eco-friendly sunscreen products are permitted in Palau. To purchase eco-friendly sunscreen products, please scroll to the bottom of this page, and click on the Stream2Sea banner link, use code, “cleanreef” for a 10% discount. Price is per person and based on double occupancy and items specified. Space is subject to availability, price subject to change without notice and not guaranteed until deposit is received. Cost for airfare cannot be guaranteed until paid and ticketed. Some restrictions may apply. * Credit card payments can expect an additional 3% to be added to the final invoice for all payments made with credit cards. This fee covers the cost of PayPal. Checks are always welcome. If interested, please contact Andy Skuntz, at Colorado Dive + Travel Adventures, email to askuntz@yahoo.com, or call at 719-322-6941. Trip flyer, terms and conditions, and a trip application will be provided. Once the application is complete, please return to Andy, then an invoice for the designated deposit will be provided.